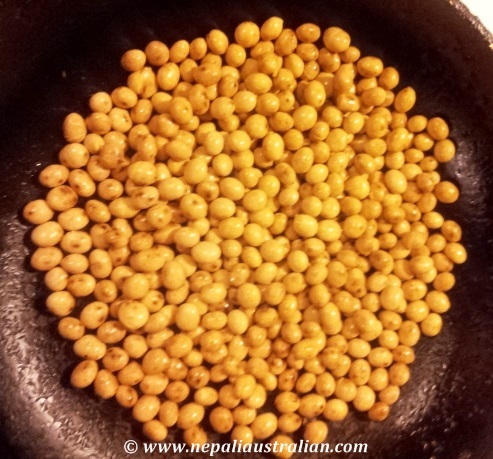 Bhatmas is Nepalese for soya beans and this is one of the easiest and quickest recipes. Fry soybeans (with oil or without oil) in a pan until the beans are cook. Soybeans is cooked when the cover started to brown, take it off the heat and let it cool. Add ginger, garlic, green chilli, salt and red chili powder. Mix well. Bhatmas sadeko is ready to be serve. 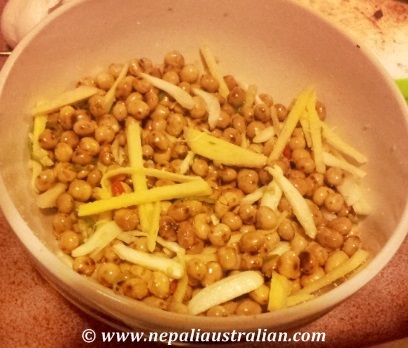 This entry was posted in Foodie, Nepal, Nepali food, Recipe and tagged Bhatmas, dinner, food, nepali easy recipe, nepali recipe, soyabean recipe, vegetarian. Bookmark the permalink. Do you fry dried beans, or soak them first? Very interesting recipe! Thanks! I assumed you soaked the beans first… wow. i tried to make twice at home by following the above mentioned tips but bhatmas was so hard that it was difficult for me to chew… how can we make bhatmas soft ? I know hot oil makes the soybean softer so try bit of oil. Also cook this just before you eat as when it is warm and it is much softer than when it is cold. Please let me know how you went.